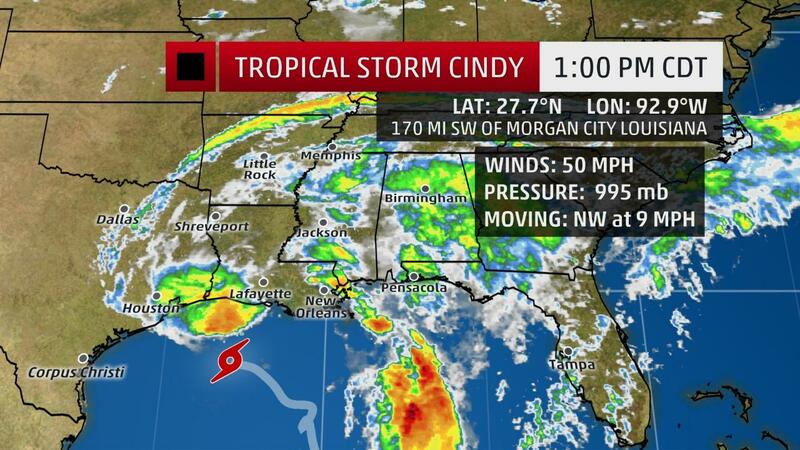 Tropical Storm Cindy continues to track through the northwest Gulf of Mexico, bringing potentially life-threatening flooding concerns to parts of the Gulf Coast and South through late this week. Gusty winds, rip currents and isolated tornadoes are also expected. Moisture and energy from Cindy will also spread north and east ahead of a cold front Thursday-Friday, which will result in heavy rain and possible flooding from the South to as far north as the Ohio Valley. A tropical storm warning has been issued from San Luis Pass, Texas, to the mouth of the Mississippi River, which means tropical storm conditions are expected within 36 hours. This warning area includes Houston, Galveston, Texas, Lake Charles, Louisiana, and Lafayette, Louisiana. Tropical storm conditions are ongoing in the warning area and will spread westward within the warning area through early Thursday. Satellite and radar imagery show shower and thunderstorm activity along the Gulf Coast. That stormy weather is located mainly to the north and east of the low-pressure center, which is over 150 miles southwest of Morgan City, Louisiana.